Go ahead and ask me anything. I have been paying attention to your questions throughout all of 2016. As a matter of fact, I thought it would be interesting to share the most popular questions with you. Let’s get to it! What color is the paint on your walls? I field this question very regularly. The truth of the matter is it is a custom blend which I couldn’t pinpoint for you today. 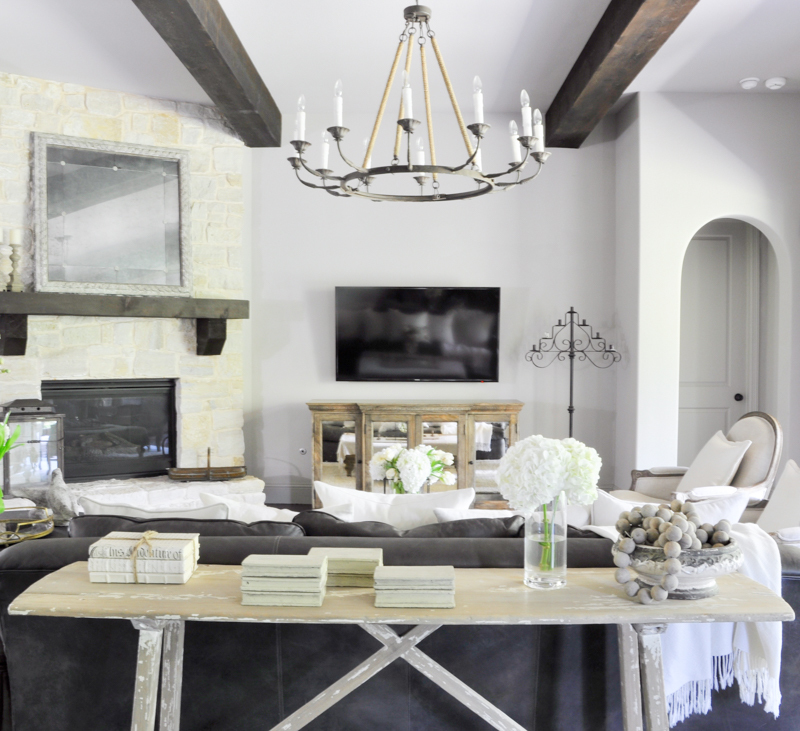 However, a paint that most closely resembles it is Behr Perfect Taupe. It is darker than my paint, but they should be able to reduce it for you at the paint store until you feel the color is correct. I should also point out that this color does not photograph all that well. The colors you see in my images on here and on Instagram are different than the actual color. I would suggest you bring in the image with the wall color you would like to replicate to your local paint store and work from there. What color is the paint on your kitchen cabinets? When we went to select our cabinetry for this home, while there I decided we needed to do three cabinet color choices. My husband looked at me like I had lost my mind. The perimeter cabinets are black. The vent hood is a soft gray with some inking/aging along interior joints. The island is a weathered blueish gray combined with an aging product. Kent Moore is the manufacturer and they actually perform paint touch up on cabinets in your home. What a perk! I also get asked about the brick back splash. It is by ACME and the brick faces were cut thin so they could be mounted on the wall. 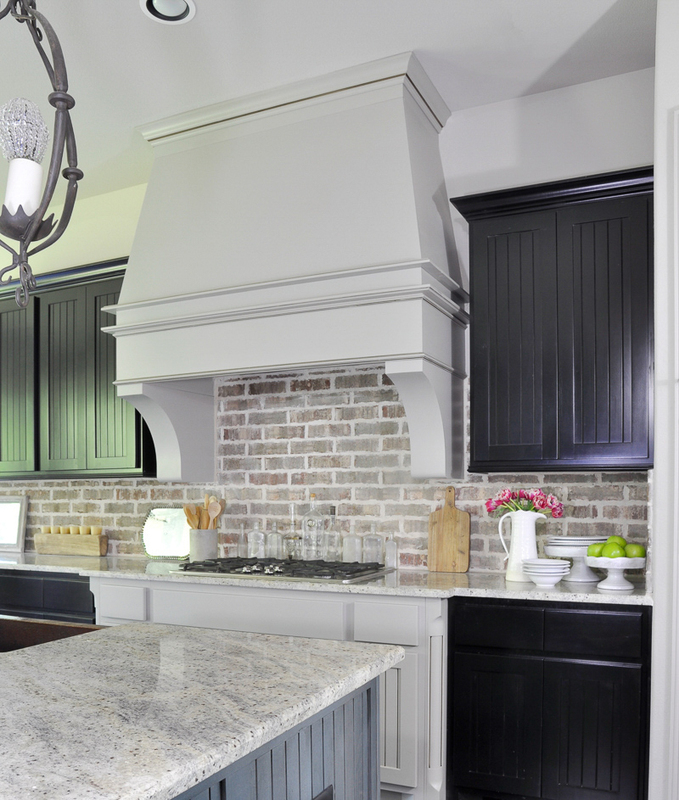 As brick is porous, make sure living with a brick surface in your kitchen is the right choice for you. We do not cook with a lot of oil in our home. I would imagine that excessive oil in the cooking process will eventually discolor the brick around your cook top. Where did you get ______? I wrote a full post about growing your Instagram account. You can find it here. How do you keep your house so clean with four dogs? I have 5 Roombas. Just kidding. But, that would be awesome! I literally vacuum the home nearly every day. If a day goes by that we do not vacuum, the floors are swept with a duster which picks up pet hair quite well. 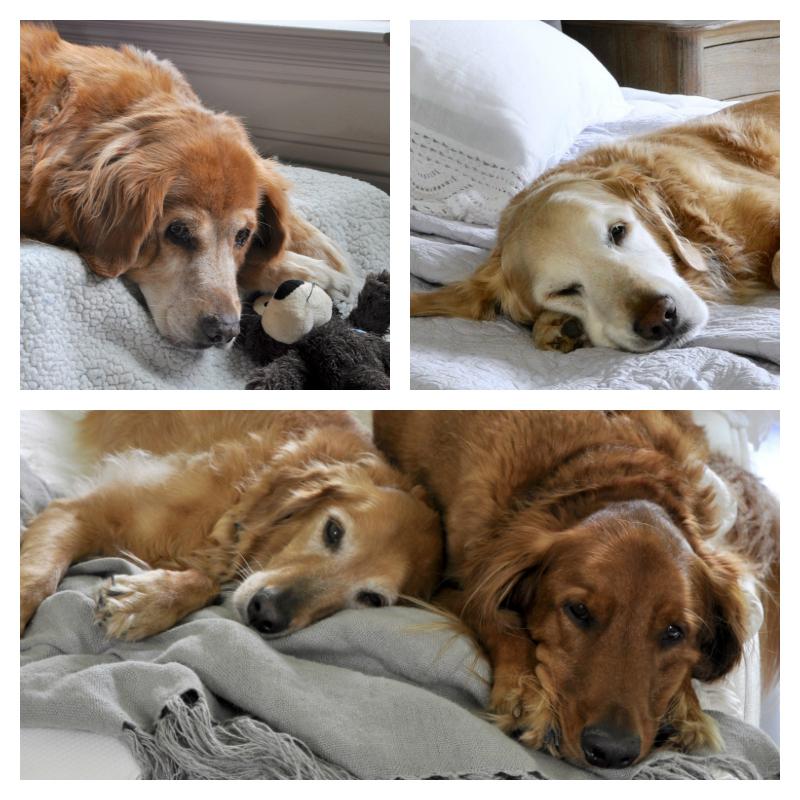 Additionally, it does not hurt that our dogs are gold in color. Thankfully that hair blends in with the wood floors and our fabrics throughout our home. In the spirit of transparency, I do have the home professionally cleaned twice per month. Check back for a full post about this coming soon. I don’t. Running this blog and my Instagram account is beyond a full time job. I cannot express to you the time and dedication it takes to manage these two entities. You would be amazed. In case you missed it, you can see my top 10 posts of 2016 here. I am enjoying this journey and I am very excited for 2017 and beyond. I hope you stick around and take it with me! Love this Jen!!! Your sweet pups always make me smile! 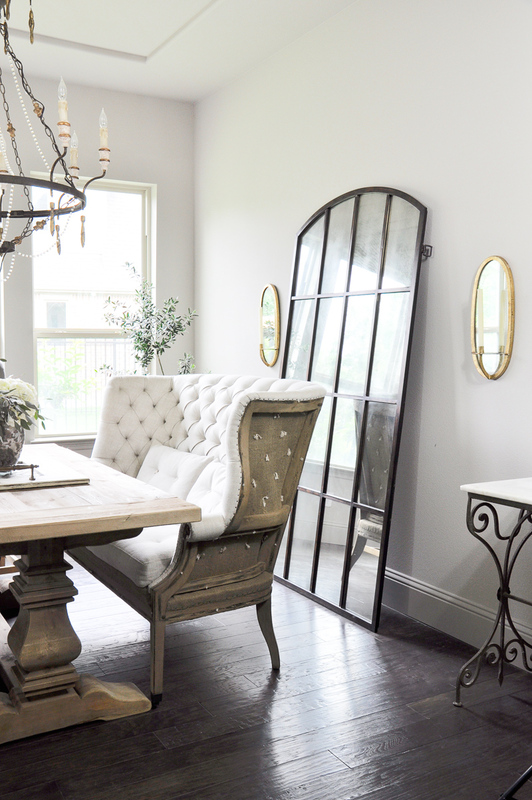 Your home is so inspiring and you my friend are such an amazing designer! I’m so lucky to call you my dears friend! Thank you so much Randi! I’m the lucky one!!! See you in ONE WEEK!!! Your home is lovely. It looks so calm and serene, yet still comfy and liveable. And those pups!! Thanks for sharing your sources, and for your great posts. Jae, thank you so much! Your words are so kind! Hi! Your home is beautiful! Where did you get your iron pendant lights over your kitchen island? I’ve seen others ask this question. It I’ve never seen the answer! Thanks! Hi Susan! Thank you so much! I try to answer all questions. If I see them, I answer them, but unfortunately I don’t see all of them. I ordered the pendants four years ago from a local design store. I’ve looked for an online for a source without success. I have a feeling they are discontinued, but if I ever find something similar, I will definitely add them to my sources page.